Those of you who regularly read this blog, will probably know that I am a self confessed Cookie Monster. However, it is not just cookies I enjoy. 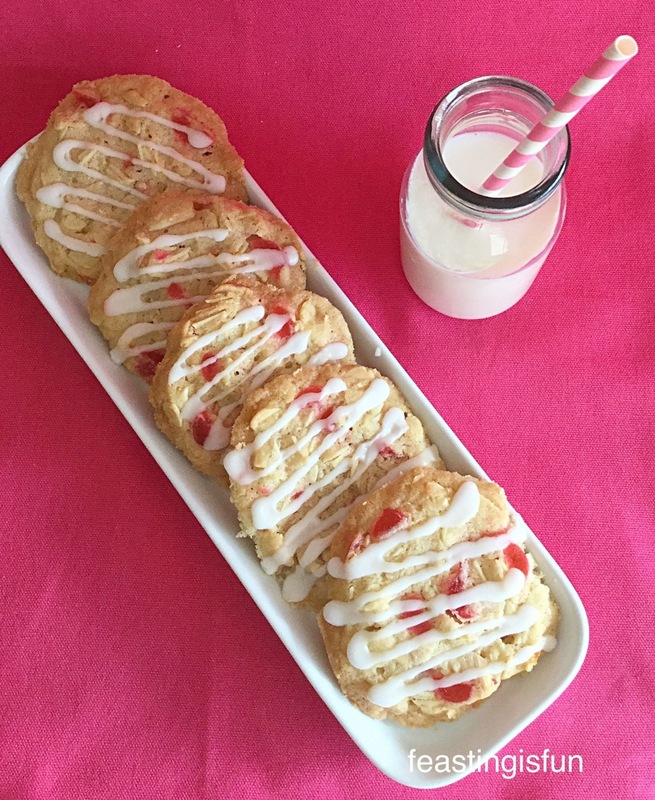 For me, biscuits, cookies and shortbread all have an equal place in my heart. 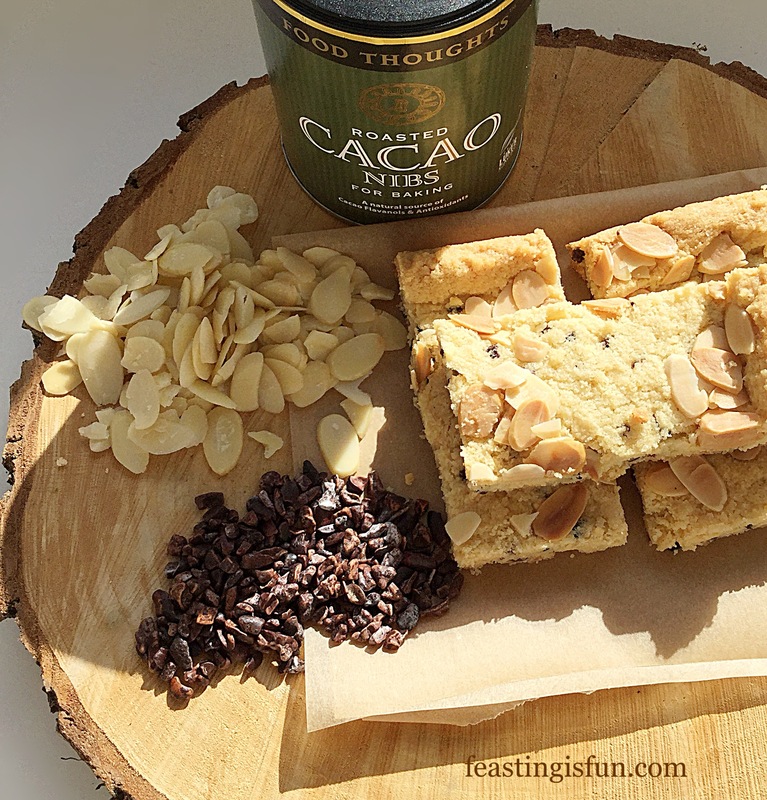 Well that was until I made these Almond Cacao Nib Shortbread Bars. Crunchy, flaked almond topped bars, studded with a deep, deep, slightly bitter chocolate flavour from the cacao nibs. Everything needed to satisfy a cookie craving. Since receiving a tub of Cacao Nibs from Food Thoughts, I was interested to see how their flavour would transfer in the shortbread. Each nib is packed with an intense flavour. Similar to very good quality, high cocoa content chocolate. In fact, Cacao nibs are chocolate in its purest form before anything has been added to it. Each nib is a fermented, then roasted part of a cocoa bean. Resulting in the purest chocolate flavour. While I am not a fan of very dark chocolate, these tiny nibs give just the right amount of flavour in this bake. Complimented by the almonds, each nib bursts with intense flavour on the tongue, without being cloying or overwhelming. 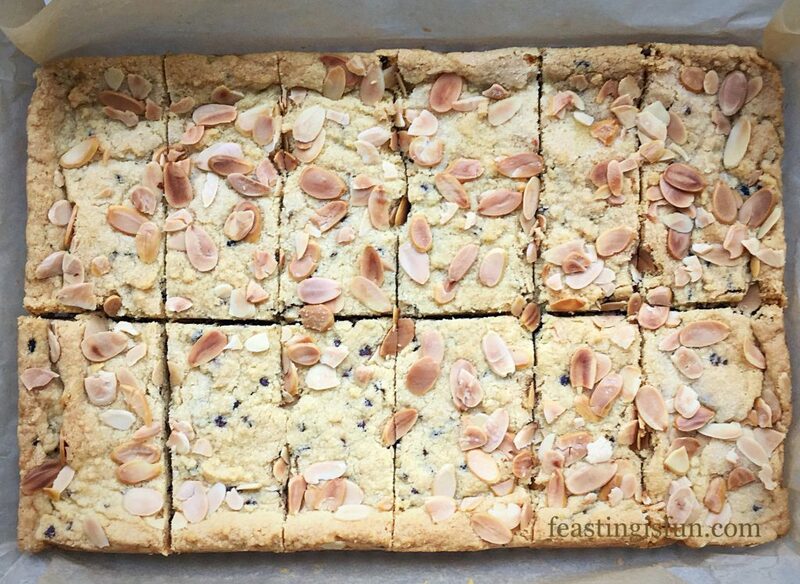 In short, these shortbread bars are incredibly delicious and a satisfying treat. 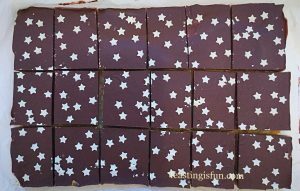 As each shortbread bar is a substantial size, smaller squares may be created by cutting each bar in half. 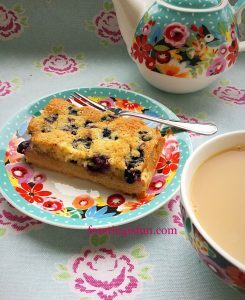 Small shortbread squares would be perfect for serving with Afternoon Tea. While the individual bars fit happily into packed lunch boxes. 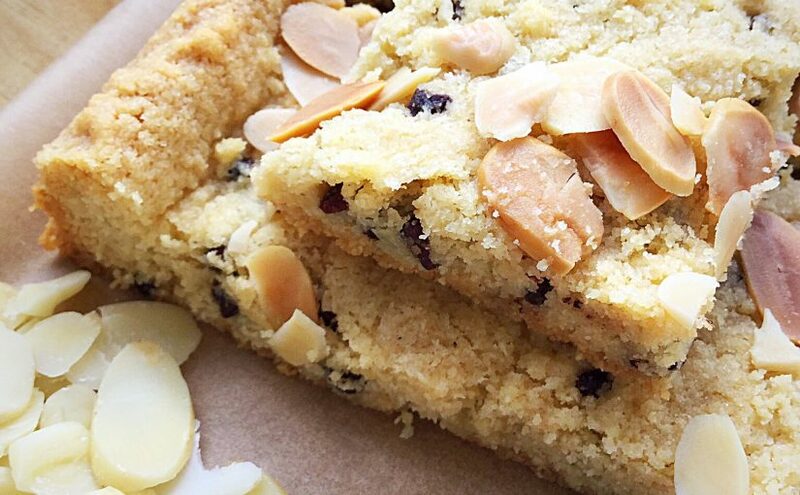 Whichever way you cut and serve this shortbread, be sure to share it. Introducing new flavours into a bake is most definitely an experience not to be kept to yourself. Butter and line a 28 x 20 x 5cm (12″ x 8″ x 2″) Swiss roll tin with baking parchment. Into a large bowl add the butter, sugar and salt. Whisk together until pale and creamy. Add the vanilla extract and whisk to incorporate. 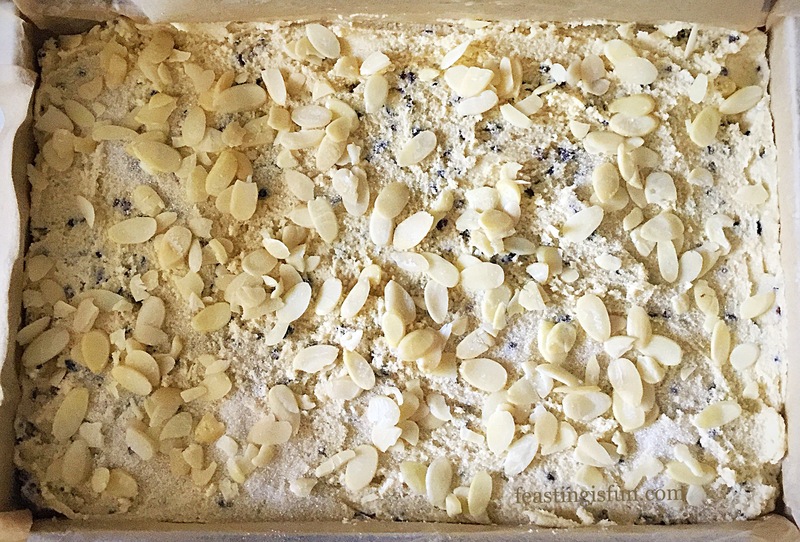 Sift in the plain flour and then add the ground almonds, semolina and cacao nibs. 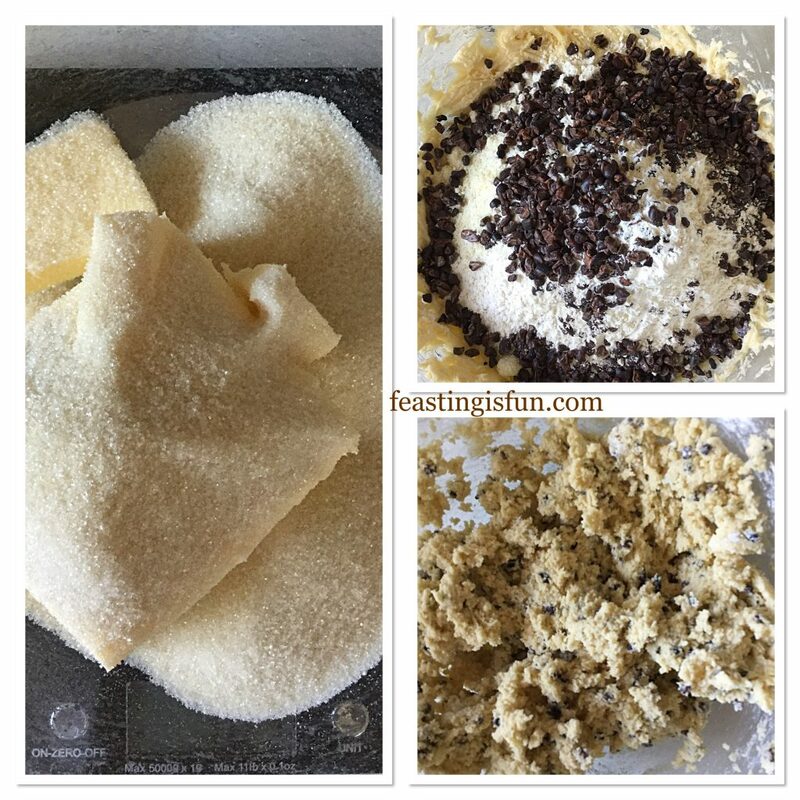 Spoon the shortbread mixture into a prepared tin. Press out, using the back of a metal spoon, so that the mixture evenly fills the tin. Dock the shortbread all over with a fork. 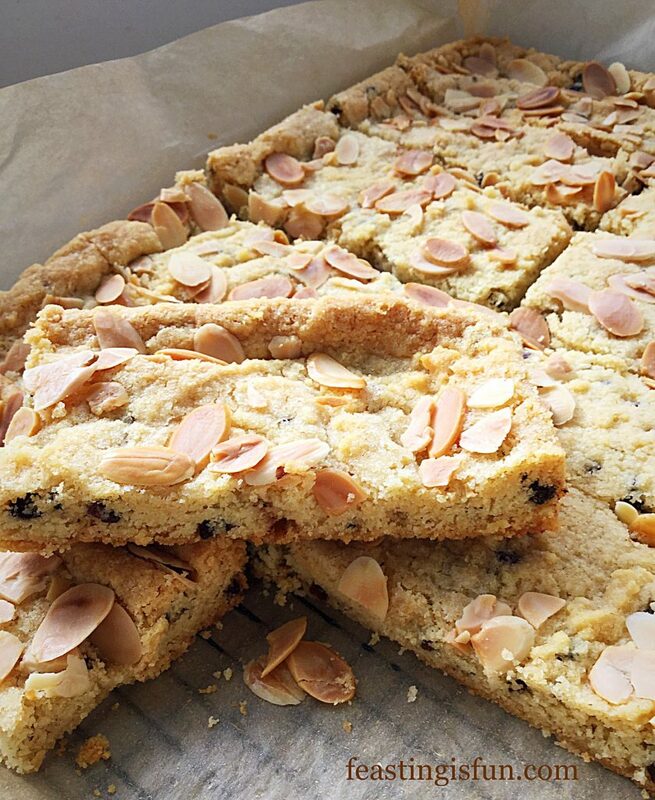 Sprinkle over the additional tablespoon of sugar and evenly scatter over the flaked almonds. 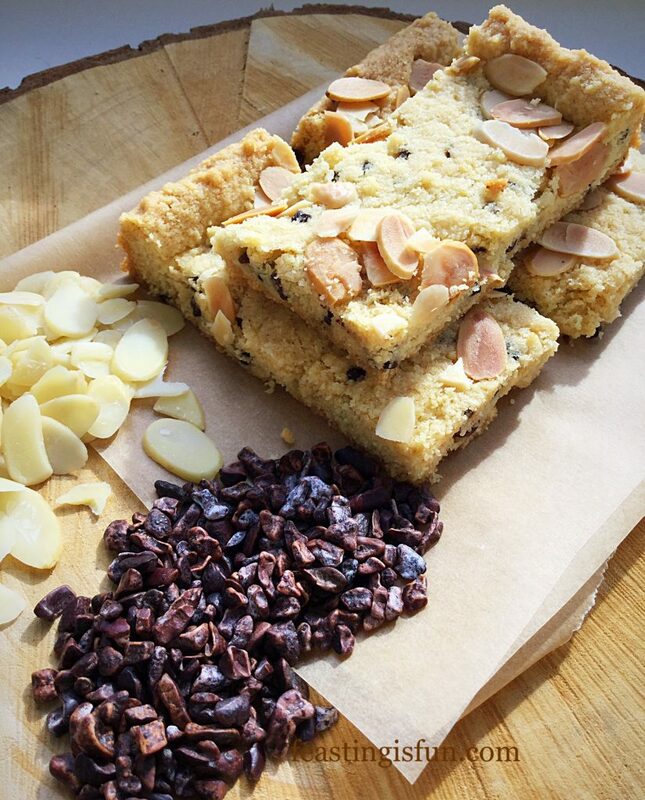 Almond Cacao Nib Shortbread Bars ready for the oven. 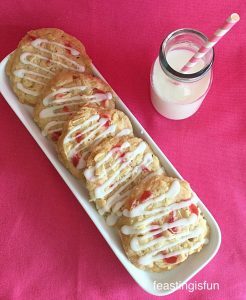 Place the shortbread into the centre of a preheated oven and bake for 35-45 minutes. 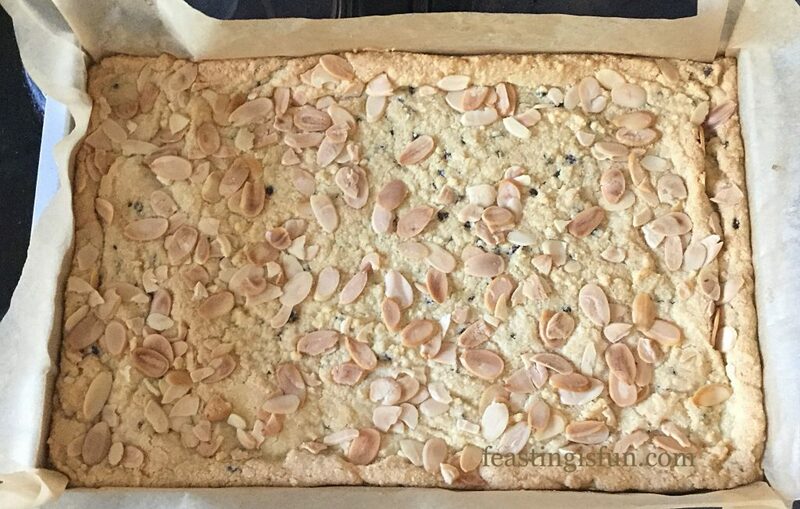 If you find that the almonds are browning too quickly, either reduce the heat and bake for a little longer, or cover the top of the shortbread with aluminium foil. When golden all over and semi-firm to the touch the shortbread is baked. Once baked remove the shortbread from the oven and allow to cool for 10 minutes in the tin. 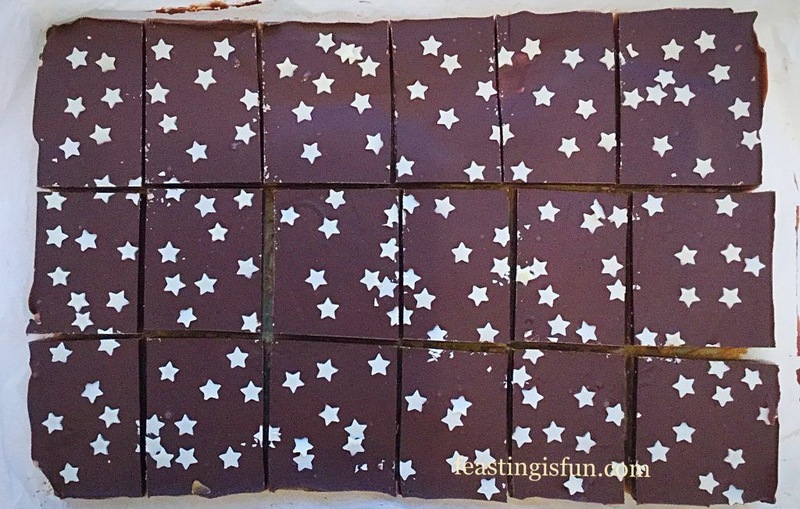 After the cooling period slice the shortbread into 12 bars. Cut across the middle, then down the width, forming 4 squares. Follow by dividing each square into 3. To create 24 squares, simply cut across the middle at 4 even (8cm) spaces. Leave the shortbread to fully cool in the tin. Once cooled, use a palette knife to help lift out the shortbread. Because the shortbread has already been cut it is more flexible and therefore unlikely to crack, when removing from the tin. Serve with a hot drink. Unsurprisingly these bars go well with coffee, tea and of course, hot chocolate. Store in an airtight container for up to one week. Since these bars improve in flavour after a day, dare I suggest you hide the tin? It’s only for a day 😉. While biscuits and shortbreads are readily available in the shops, there are advantages to making your own at home. Firstly and most importantly to me, the flavour is far superior to their mass produced equivalents. Furthermore flavour combinations that cannot be bought, I can easily make at home. Finally, unless you live close to an artisan bakery, where each product is made with love and care, baking at home is a pleasure. Since you know exactly what ingredients have gone into your bake, including the love with which they are made. Food Thoughts sent me the cacao nibs to try. All opinions, content and photography are my own. No part of this post may be reproduced or copied without the specific, written permission of the owner. Please see my Disclosure Policy . These bars seem to be really my taste! Thank you Rena. Let me know if you try them x? Well kudos to you Sammie!! I love this recipe and can’t wait to try it. It sounds soooo good. 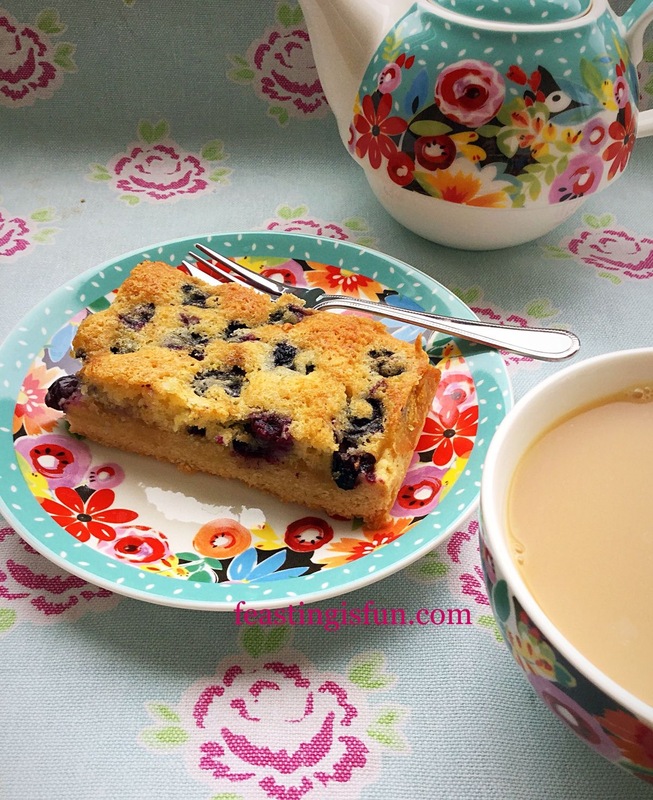 Thanks for sharing your mouth watering recipes that I’m crazy over !